The Asuka period (飛鳥時代, asuka jidai), lasting from 538 to 710, was a period in the history of Japan during which the capital was located in Asuka, on the plains near Nara. It lasted from the middle of the sixth century to the beginning of the eighth century, although it could be said to overlap with the preceding Kofun period. The Asuka period is also distinguished by the change in the name of the country from Wa (倭) to Nippon (日本). The Asuka period is known for its significant artistic, social, and political transformations, which had their origins in the late Kofun period. The Yamato state evolved considerably during the Asuka period, borrowing systems of political and social organization from China to reinforce the strength and legitimacy of rule by the imperial family. In 603, Shōtoku Taishi established a Confucian system of twelve court ranks, and in 604 he introduced the Seventeen-Article Constitution (憲法十七条, Kenpō jushichijō), which clearly established the duties and rights of the ruler, government ministers, and the people. This effort was followed by the Taika Reform (645-649), which established the ritsuryō (律令), a system of social, fiscal, and administrative institutions which prevailed in Japan from the seventh to the tenth century. Buddhism and Daoism were introduced to Japan during the Asuka period, and eventually became syncretized with Japan's native Shinto beliefs. Immigrants from China and Korea brought new artistic and cultural influences to Japan. The term Tori style, after sculptor Kuratsukuri Tori, grandson of Chinese immigrant Shiba Tatto, is often used to describe arts of the Asuka period. The term "Asuka period" was first used to describe a period in the history of Japanese fine arts and architecture. It was proposed by fine arts scholars Sekino Tadasu (関野貞) and Okakura Kakuzo (岡倉覚三) around 1900. Sekino dated the Asuka period as ending with the Taika Reform of 646. Okakura, however, saw it as ending with the transfer of the capital to the Heijō Palace (平城京) in Nara in 710. Although historians generally use Okakura's dating, many historians of art and architecture prefer Sekino's dating, and use the term " Hakuhō period” (白鳳時代, hakuhō jidai) to refer to the successive period. The Yamato polity, which had emerged by the late fifth century, was distinguished by powerful clans or extended families, including their dependents. Each clan was headed by a patriarch who performed sacred rites for the clan's kami (神) to ensure the long-term welfare of the clan. Clan members were the aristocracy, and the kingly line that controlled the Yamato court was at its pinnacle. The local chieftainship of Yamato arose to become the Imperial dynasty at the beginnings of Asuka period, at latest. The exact beginning of Yamato rule is disputed. Its paramount position in Japan presumably starts only in the end of the Kofun period or with the advent of the Asuka period. The Asuka period, as a sub-division of the Yamato period (大和時代, Yamato-jidai), is the first period of Japanese history during which the Japanese imperial court ruled relatively uncontested from modern-day Nara Prefecture, then known as Yamato Province. The Yamato court, concentrated in the Asuka region, exercised power over clans in Kyūshū and Honshū, bestowing titles, some hereditary, on clan chieftains. As the Yamato rulers suppressed the clans and acquired agricultural lands, the Yamato name became synonymous with all of Japan. Based on Chinese models (including the adoption of the Chinese written language), the Yamato developed a central administration and an imperial court attended by subordinate clan chieftains, but with no permanent capital. By the mid-seventh century, the agricultural lands had grown to a substantial public domain, subject to central policy. The basic administrative unit of the Gokishichidō (五畿七道) system was the county, and society was organized into occupation groups. Most people were farmers; other were fishers, weavers, potters, artisans, armorers, and ritual specialists. The Yamato court had ties to the Gaya confederacy (伽耶 or 伽耶諸国) of the Korean peninsula, called Mimana (任那) in Japanese. Archaeological evidence for this has been found in the Kofun tombs, which show similarities in form, art, and clothing of similarly-ranked nobles. A second source is the Nihon Shoki (Chronicles of Japan) written in Chinese characters. For a time, many Japanese historians claimed that Gaya had been a colony of the Yamato state, a theory that is now widely rejected. 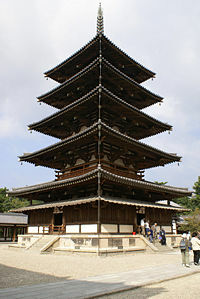 This five-storied pagoda (五重塔) in Hōryū-ji temple is the oldest such wooden tower still existing in the world. During the Asuka period, the Yamato court was revitalized by efforts made within the royal family itself, which over the course of a century reshaped the national government and set it in motion toward the formation of a centralized state. The Soga clan (蘇我氏, Soga-shi)intermarried with the imperial family, and by 587 Soga no Umako, the Soga chieftain, was powerful enough to install his nephew, Sushun, as emperor, and later to assassinate him and replace him with the Empress Suiko (r. 593-628). Suiko, the first of eight sovereign empresses, was merely a figurehead for Umako and Prince Regent Shōtoku Taishi (聖徳太子, 574-622). Shōtoku, recognized as a great intellectual of this period of reform, was a devout Buddhist, and well-read in Chinese literature. He was influenced by Confucian principles, including the Mandate of Heaven, which suggested that the sovereign ruled at the will of a supreme force. Under Shōtoku's direction, Confucian models of rank and etiquette were adopted. In 603 the prince established a system of twelve court ranks, distinguished by caps of different colors, intended to encourage the advancement of men of ability, and to give the court a proper organization and etiquette. The ranks were named for the Confucian values of virtue, humanity, decorum, faith, righteousness, and knowledge, each in greater and lesser grades. In 604, Prince Shotoku introduced the Seventeen-Article Constitution (憲法十七条, Kenpō jushichijō), which set forth the ideals of the state and rules of conduct. It clearly established the duties and rights of each of the three elements which made up the state: the ruler, government ministers, and the people. The Constitution showed the influence of Buddhism, but embodied many political and ethical ideals of Confucian government. By borrowing from Chinese ideas of government, Prince Shotoku sought to reinforce the legitimacy of the imperial house, whose power and influence had been eroded by the great clans. In addition, Shōtoku adopted the Chinese calendar, developed a system of trade roads (the Gokishichidō), built numerous Buddhist temples, had court chronicles compiled, sent students directly to China to study Buddhism and Confucianism, and sent Ono no Imoko (小野妹子) to China as an emissary (遣隋使, Kenzuishi). The exchanges between the five kings of Wa (倭の五王, Wa no Go-ō) (Japan) and China during the fifth century had established Japan as a tributary nation; Prince Shotoku opened relations with the Sui dynasty as an equal. In a move resented by the Chinese, Shōtoku sought equality with the Chinese emperor by sending official correspondence addressed "From the Son of Heaven in the Land of the Rising Sun to the Son of Heaven of the Land of the Setting Sun." From the Chinese point of view, Yamato Japan was still sending tributes (有貢無封 yūkō-mufū) to China but had a lower status than previously, because the Japanese kings no longer received titles from the Chinese court. The Yamato court, however, established extraordinary cultural and intellectual relationships with China as a result of its more relaxed political status. Numerous official missions of envoys, priests, and students were sent to China in the seventh century. Some remained 20 years or more; many of those who returned became prominent reformers. The death of Prince Shotoku in 622 impeded his reforms from being fully realized. In 643, the Soga clan killed Shotoku's son Yamashiro Oe and all his family, and took control of the government. Meanwhile, the students who had been sent to China during Shotoku’s rule were returning to Japan with accounts of the strength of the T'ang dynasty (618–907), which had overthrown the Sui dynasty and unified China. These accounts, plus the fierce competition among Silla, Paekche, and Koguryo on the Korean peninsula, impressed on educated men the need to reform the government, strengthen the power of the state, and prepare against possible pressure from outside. After the deaths of Shotoku (in 622), Soga no Umako (in 626), and Empress Suiko (in 628), court intrigues over succession led to a palace coup in 645 against the Soga clan's dominance of the government. The revolt, known as the Isshi Incident (乙巳の変, Isshi no hen), referring to the Chinese zodiac year in which the coup took place, was led by Emperor Tenji (中大兄皇子, Naka no Ōe no Ōji) and Nakatomi no Kamatari (中臣鎌足, Fujiwara no Kamatari), who seized control of the court from the Soga family and introduced the Taika Reform (大化の改新, Taika no Kaishin). The Japanese era corresponding to the years 645-649 was named Taika (大化), referring to the Reform, and meaning "great change." Although it did not constitute a legal code, the Taika Reform mandated a series of reforms that established the ritsuryō (|律令) system of social, fiscal, and administrative institutions which prevailed from the seventh to the tenth century. Ritsu (律) was a code of penal laws, while ryō (令) was an administrative code. Combined, the two terms came to describe a system of patrimonial rule based on an elaborate legal code that emerged from the Taika Reform. The country was divided into provinces headed by governors appointed by the court, and the provinces were further divided into districts and villages. Naka no Ōe assumed the title of Crown Prince, and Kamatari was granted a new family name, Fujiwara (藤原), in recognition of his great service to the imperial family. Fujiwara no Kamatari (藤原鎌足) became the first in a long line of court aristocrats. Another, long-lasting change was the use of the name Nihon (日本) , or sometimes Dai Nippon (Great Japan) in diplomatic documents and chronicles. Not long after the Taika reforms, Japan became involved in a dispute in Korea when the Paekche dynasty, whose capital fell in 660 to the combined forces of T'ang (China) and Silla, called on Japan for help. Japan, which had traditionally been friendly with Paekche, sent a large army. The empress Saimei, who was 67-seven years old, went to northern Kyushu and directed operations personally. The Japanese forces were crushed in 663, by a T'ang and Silla army at the mouth of the Kum River. Japan withdrew entirely and gave up any further intervention on the Korean peninsula. Saimei was succeeded by Prince Naka no Ōe, who became the emperor Tenji (天智天皇, Tenji Tennō) in 662, taking the additional title taking the additional title Tennō (天皇, heavenly sovereign). This new title was intended to improve the Yamato clan's image and to emphasize the divine origins of the imperial family in the hope of keeping it above political frays, such as those which had been precipitated by the Soga clan. He built fortifications in Kyushu to prepare for an expected T'ang and Silla invasion, and amended the system established by the Taika reforms to make it more practical. Upon his death, a fierce dispute over succession erupted into warfare between the supporters of his younger brother and those of his uncle. His younger brother was victorious, and ascended the throne as the emperor Temmu (天武天皇). He also worked to reinforce the strength of the imperial government. He upgraded the status of the Shinto shrine at Ise, making it the foundation of the dynasty's legitimacy; propagated Buddhism nationwide as a means of protecting and strengthening the state; ordered the compilation of official histories to reinforce the legitimacy of the imperial family and increase national prestige; and had the Taika reforms codified as the Asuka Kiyomihara Code. Several empresses reigned from the fifth to the eighth centuries, but after 770 succession was restricted to males, usually from father to son, although sometimes from ruler to brother or uncle. The Taihō Code provided for a Confucian-style penal system (imposing light rather than harsh punishments) and Chinese-style central administration through the Jingi-kan (神祇官) (Department of Rites), which was devoted to Shinto and court rituals, and the Daijō-kan (太政官) (Department of State), with its eight ministries (for central administration, ceremonies, civil affairs, the imperial household, justice, military affairs, people's affairs, and the treasury). Although the Chinese-style civil service examination system was not adopted, the college office (大学寮, Daigaku-Ryō) was founded for training future bureaucrats based on the Confucian classics. Tradition circumvented the system, however, as aristocratic birth continued to be the main qualification for higher position, and titles were soon hereditary again. The Taihō Code did not address the selection of the sovereign. Fujiwara Fuhito (藤原不比等), son of Nakatomi no Kamatari, was among those who produced the Taihō Ritsuryō. According to the history Shoku Nihongi (續日本紀), two of the 19 members of the committee drafting the Taiho Code were Chinese priests (Shoku-Shugen and Satsu-Koukaku). Chinese priests took an active part as linguistic specialists, and received a reward from the Empress Jito. Bodhisattva, Asuka period, seventh century, Tokyo National Museum. Since the seventh century, the Yamato government had sent envoys directly to the Chinese court, from which it obtained a wealth of philosophical knowledge and social doctrine. In addition to ethics of government, it also adopted the Chinese calendar and Confucian, Taoist and Buddhist religious practices. Prince Shotoku’s new constitution for Japan was based on the Chinese model. Japan had been very positive during the Kofun period towards the introduction of Chinese culture and immigration. The Asuka period showed a marked change in attitude; Japan began to have a national identity, with its own population and culture, and concentrated on assimilating earlier waves of immigrants into a single people. Chinese and Korean immigrants who became naturalized in ancient Japan were called Torai-Jin (渡来人). They introduced many aspects of their language, culture, and traditions to their adoptive country. Japan gave preferential treatment to these torai-jin because the Yamato Court valued their knowledge and culture. According to the record of Shinsen-shōjiroku (新撰姓氏録), a list of aristocratic names officially compiled by the Yamato Imperial Court in 815, one-third of the noble families on the list had their origins in China or Korea. Of the 1,182 listed, 163 were from China, and more than 240 were from the Korean peninsula (104 from Baekje, 41 from Goguryeo, and 9 from Silla). Buddhism and Confucianism strongly influenced Japanese philosophy. Japan also absorbed many other elements of Chinese technology and culture, including the writing system, architecture, and methods of producing steel. In addition, many Chinese scholars (続守言 , 薩弘恪) were on committees that drew up legal codes, thus having a strong influence on the emerging Japanese legal system. However, these immigrants were generally treated as lower class in Kabane systems which classified the various clan members of the court. They were generally ranked as "Atai," "Miyatsuko," or "Fubito," while members of ruling clans such as Soga, Mononobe, and Nakatomi were ranked as "Omi" or "Muraji." An example of a typical descendant clan was the Yamatonoaya clan (東漢氏), which was descended from Emperor Ling of Han. This clan's leader, Achi-no-Omi (阿智使主), introduced many elements of Chinese culture to Japan. According to the Nihongi (Chronicles of Japan), during Emperor Kimmei's reign the Hata clan (秦氏), descendants of Qin Shi Huang, introduced sericulture (silk production). The Kawachino-Fumi clan (西文氏), descendants of Gaozu of Han, introduced Chinese writing to the Yamato court, according to the Shinsen-shōjiroku. The Takamoku clan are descendants of Cao Pi. Takamuko no Kuromaro (高向玄理) was a central member of the committee which wrote the Taika Reform. Tori Busshi (止利仏師), also from China, was one of the most active artists in the Asuka period. In 660, one of the three kingdoms of Korea, Baekje, fell to Silla and T'ang China. Subsequently, quite a large number of refugees from Baekje migrated to Japan. The Yamato Imperial Court accepted the royal family and the refugees of Baekje. The royal family of Baekje received the name "Kudara no Konikishi" (百済王, lit. kings of Baekje) from the emperor. The number and cultural impact of the refugees during this period was downplayed during the occupation of Korea in the earlier part of the twentieth century for political reasons. Most Japanese historians now agree that, in addition to strong influences from China, immigration from Baekje also contributed heavily to cultural development during the subsequent Nara period. The Daibutsu at the Asuka dera in Asuka. This is the oldest known sculpture of Buddha in Japan with a exact known date of manufacture, 609 C.E. The sculpture was made by Kuratsukuri-no-Tori, son of a Korean immigrant. 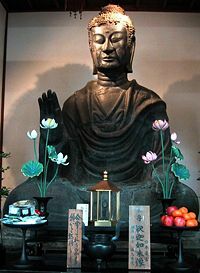 The introduction of Buddhism (仏教, Bukkyō) to Japan is attributed to the Baekje king Seong in 538. The Soga clan, a Japanese court family that rose to prominence with the ascension of the Emperor Kimmei about 531 C.E., favored the adoption of Buddhism and of governmental and cultural models based on Chinese Confucianism. But some at the Yamato court, such as the Nakatomi clan, which was responsible for performing Shinto rituals at court, and the Mononobe, a military clan, wished to maintain their prerogatives and resisted the alien religious influence of Buddhism. The Soga introduced Chinese-modeled fiscal policies, established the first national treasury, and considered the kingdoms of Korea as trade partners rather than as objects of territorial expansion. Acrimony continued between the Soga and the Nakatomi and Mononobe clans for more than a century, during which the Soga temporarily remained ascendant. In the Taika Reform, the Funeral Simplification Edict was proclaimed, and building of large kofun (tumuli) was banned. The edict also regulated size and shape of kofun by classes. As a result, later kofun, though much smaller, were distinguished by elaborate frescoes. Paintings and decorations of those kofun indicate the spread of Daoism and Buddhism in this period. The Takamatsuzuka Kofun and Kitora Kofun are the most famous for their wall paintings. With the dawn of the Asuka period the use of elaborate kofun tombs by the imperial family and other elite fell out of use because of prevailing new Buddhist beliefs, which put greater emphasis on the transience of human life. Commoners and the elite in outlying regions, however, continued to use kofun until the late seventh century, and simpler but distinctive tombs continued in use throughout the following period. Shotoku Taishi was himself an earnest Buddhist scholar who gave lectures on the scriptures. His commentary on the Lotus Sutra, four volumes of which survive in the original draft written by the prince himself, is considered the oldest written work of known authorship in Japan. Under his rule, imposing Buddhist temples were built in the Chinese style. The Horyu Temple, founded between 601 and 607 at Ikaruga, in present Nara prefecture, still preserves its ancient wooden structures; these buildings, dating from the late seventh and early eighth centuries, are the oldest wooden structures in the world. From 600 to 659, Japan sent seven emissaries to T'ang China. But for the next 32 years, during the period when Japan was formulating its laws based on Chinese texts, diplomatic relations with China were cut off and none were sent. Japan sent eleven emissaries to Silla, and Silla is also recorded in Nihon Shoki as sending embassies to Japan 17 times during the reigns of Emperor Temmu and Empress Jitō. The ruling classes of Yamato and Baekje were on amicable terms, and Yamato deployed its navy to aid Baekje, in 660-663, against an invasion by Silla and T'ang China (Battle of Baekgang). Daoism was also introduced during the Asuka period. In the mid-seventh century, Empress Saimei built a Daoist temple at Mount Tōnomine (多武峯談山). Many stone turtles (亀石, kameishi), a form common among Daoist sites, have been discovered in Asuka and are assumed to have been created during Saimei's reign. The octagonal shape of monarchs' tombs of this age and the celestial maps drawn in Kitora and Takamatsuzuka also reflect the Daoist cosmology. Tennō (Emperor), the new title of the Japanese monarch in this period, could also be argued to derive from the name of the supreme God of Daoism, Tenko-Taitei (天皇大帝), the God of Polaris. Daoist belief was eventually amalgamated with Shintō and Buddhism to establish new styles of rituals. Onmyōdō, a sort of Japanese geomancy and cosmology, is one of the fruits of those religious mixtures. While the Asuka period started with conflict of religious belief between clans, later in the period, the imported religions became syncretized with Japan's native folk beliefs. Early Buddhist architecture in Japan was so similar to temples on the mainland that, because of the lag of development from the mainland to the archipelago, surviving buildings provide scholars with examples of how Chinese and Korean architecture of the same era looked. Korean architecture of the time was a stylistic link between classical Chinese architecture and later Japanese buildings. 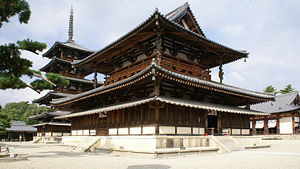 The construction of the original and reconstructed Hōryū-ji Temple was also strongly influenced by Silk Road] culture. For instance, the pillar in Hōryū-ji is similar to the pillar of the Parthenon of ancient Greece. After the tower (Stupa) of India had been converted by architectural technology of China, it became a five-storied pagoda (五重の塔) in Japan. Goguryeo paintings in tombs had important influences in Japan. Decorated tombs and painted tumuli which date from the fifth century and later found in Japan are generally accepted as Korean exports to Japan. The Takamatsuzuka tomb even features paintings of women in distinctive clothes also seen in Goguryeo wall painting. The earliest Japanese Buddhist art is known as Tori Style, a term which is often used interchangeably with the Asuka period itself. The term derives from the style and influence of sculptor Kuratsukuri Tori, grandson of Chinese immigrant Shiba Tatto. Tori style shows strong influence of the Chinese Northern Wei style. Some of the characteristics of the style include marked, almond-shaped eyes, and symmetrically arranged folds in the clothing. The most striking and distinguishing feature of these sculptures is an expression of the smile that is called “archaic smile.” Asuka Daibutsu, the Shaka triad produced by Kuratsukuri Tori for the Hōryū-ji, is one of the best Buddhist works of art from that time. 538: The Korean kingdom of Baekje dispatches a delegation to introduce Buddhism to the Japanese chieftain. 593: Prince Shotoku is assigned as regent of Empress Suiko and promotes Buddhism with Soga clan. 600: Yamato state sends the first official Japanese mission to China since 478. 604: Prince Shotoku issues a Chinese-style constitution (Seventeen-Article constitution), based on Confucian principles, which inaugurated the Japanese Empire. 607: Prince Shotoku builds the Buddhist temple Hōryūji in Ikaruga. 645: Soga no Iruka and his father Emishi are killed in the Isshi Incident. Emperor Kotoku ascends to the throne and strengthens imperial power over aristocratic clans (see Taika Reform), turning their states into provinces. 663: Japanese navy was defeated by Silla-Tang allies in Battle of Baekgang, failing to restore Baekje. 670: First Koseki (Family registry, Kōgo-Nenjaku) was compiled. 672: Prince Ōama, later Emperor Temmu usurped the throne by winning the civil war (Jinshin no Ran) against Emperor Kobun. 689: Asuka Kiyomihara Code was proclaimed. 701: Taihō code was proclaimed. ↑ William Wayne Farris, Sacred Texts and Buried Treasures: Issues on the Historical Archaeology of Ancient Japan, University of Hawaii Press, 1998. Retrieved June 20, 2007. ↑ 文武紀一續日本紀　卷第一. Retrieved June 20, 2007. ↑ 国史大系版 『続日本紀』. Retrieved June 20, 2007. ↑ W. G. Beasley. The Japanese Experience: A Short History of Japan. (Berkeley: University of California Press, 2000. ISBN 0520225600) Retrieved June 20, 2007. ↑ George Sansom, (1958). A History of Japan to 1334. (Stanford, California: Stanford University Press), 47-49. ↑ Shotoku Taishi, Encyclopedia of World Biography. Retrieved June 20, 2007. ↑ Banister Fletcher and J. C. Palmes. Sir Banister Fletcher's A History of Architecture. (18th ed. )(New York: Scribner, (original 1928) reprint 1975). ↑ Sarah Milledge Nelson. The Archaeology of Korea. (Cambridge, UK: Cambridge University Press, ISBN 0521407834), 236  . Retrieved June 20, 2007. ↑  "Complex of Koguryo Tombs" UNESCO World Heritage Centre. Retrieved June 20, 2007. ↑  Sacred Texts and Buried Treasures: Issues on the Historical Archaeology of Ancient Japan. (University of Hawaii Press, 1998), 95. Retrieved June 20, 2007. ↑  "Tori style" Britannica Concise (Encyclopædia Britannica). Retrieved June 20, 2007. ↑ Taku Kurashige and Rie Yamada. (2003) . Timeline of Japan. "Asuka Period." (in English and Japanese). Retrieved June 20, 2007. Hall, John Whitney. 1971. Japan; from prehistory to modern times. Tokyo: C.E. Tuttle Co.
Hong, Wontack. 1988. Relationship between Korea and Japan in early period: Paekche and Yamato Wa. Seoul, Korea: ILSIMSA. This article contains material from the Library of Congress Country Studies, which are United States government publications in the public domain. All links retrieved April 22, 2016. History: Asuka Period (550-710 C.E. ), Clothes during Asuka period. Massachusetts Institute of Technology. Asuka and Nara Periods (538–794), Timeline of Art History, The Metropolitan Museum of Art. Early Japanese Buddhism, Japanese Buddhist Statuary. This page was last modified on 22 April 2016, at 15:05.